Do you ever let a mistake weigh you down? Do you allow it to discourage you so much that you don’t move forward? Even if your mistake feels like its larger than life to you, it probably didn’t take place in front of millions of people with no way to correct it at the moment. Look at the mistake – figure out what went wrong and why. Ask others for help, if needed. Create a way to turn the mistake into a fun memory – maybe even find a clown to help you. There was a technical malfunction with one of the four legs of the torch during the opening ceremony 16 days ago – so they created a fun way to address it the closing ceremony. 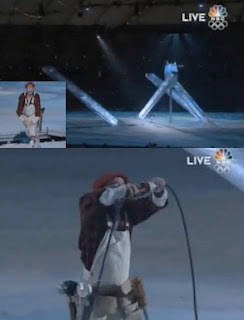 As the announcer poked fun at the issue, a clown came out, dramatically plugged the leg in and it rose perfectly. The crowd cheered, loving it. What mistake can you overcome with a little creativity? Are you able to laugh at yourself and move on? So true Susan – some mistakes need more 'repair' than others and unfortunately some are unrepairable. I was thinking of the kind of mistakes that won't really matter a year from now, but we allow them to ruin too many days of our lives.